Geometric Wool Patterned Cushion Covers from Peru (Pair), "Angelfish"
Colorful angelfish swim in a sea of green and gold. 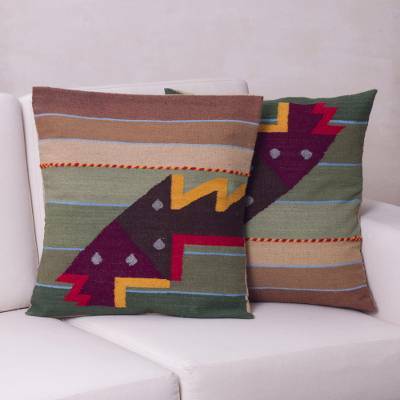 Working on the handloom, Faustino Maldonado and his family creates a mesmerizing pair of cushion covers. Bright strands of wool form the angular fins and tail. A slot opening at the back permits insertion of the cushions (not included). Faustino Maldonado was born in Hualhuas. Because his parents and grandparents were artisans, he learned at an eary age to weave on rustic looms, to prepare the warp using the pushca, and spin on the rueca. Since he first started weaving, Maldonado has mastered the art and has immensely improved the quality of his textiles. Maldonado's work is a representation of the art that has been passed down from generation to generation within his family. The family motto has been, "I will never let go of either my grandfather or grandson's hands, for what I have learned from the elders, I will teach to the young." Based on this family philosophy, Maldonado and his relatives have been making large bedspreads in high relief without any stitching. They also proudly craft sheep wool and alpaca tapestries, purses, backpacks, cushions, and vests. The Maldonado family's works have become increasingly popular.